Thru vs. Through—Which Is Right? Through can be a preposition, an adjective, and an adverb. Through is the only formally accepted spelling of the word. 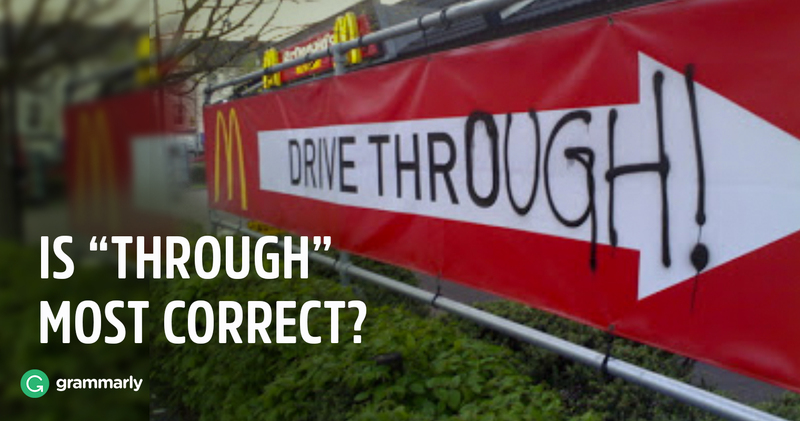 Thru is an alternate spelling that should be used only in informal writing or when referring to drive-throughs. As if all the confusion over the words through and threw wasn’t enough, modern English has piled on yet another homophone: thru. He rode his bicycle through the door and onto the street. You have to read the book through if you want to be prepared for class. We were dancing all through the concert. Did you come thru with the tickets? Come to my place, we’ll go thru all the episodes of Firefly. The bank opened its first drive-thru on Monday. The management of the Pittsburgh Symphony Orchestra has canceled orchestra concerts through Dec. 5. The traffic pattern will be similar to last year and motorists should allow extra time to get through the area during shift changes. Over 100 people got married or renewed their vows in “run-thru” weddings on Sunday during the Rock ’n’ Roll Las Vegas Marathon. On Tuesday afternoon, she is the second person to pull into Drive-Thru Prayer at Tyner, an event that has taken place on the first Tuesday of each month since September.